Yikes, it's been a while. I was sort of hosed this week, so this was last weekend's work. 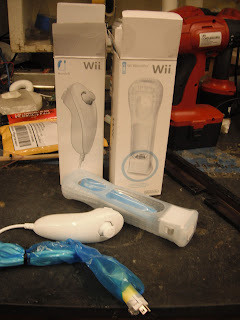 The rest of the electronics arrived yesterday, including a Wiimote and nunchuck. They obviously didn't want to be disassembled. I quickly encountered the infamous Nintendo "tri wing" screw. Not even the immense tool collection of MITERS had such a screwdriver. Instead, I drilled them out, absolutely mangling the cute Nintendo peripherals in the process. The sensors intact, I desoldered their proprietary connectors and replaced them with wires. Next, I soldered the arduino, 90 degree pin headers, and sensors to the shield. The thing in the background is an open source piece of java based software used for multiwiicopter configuration. It's pretty straightforward to use, and it lets me know that the board is working. Each of the colored lines represents the magnitude of a gyro or accelerometer reading. It was pretty satisfying to see my motions made into a graph in real time. I also drilled some holes in my frame and attached the motors and props just to see how it looked. Anyway, I wrote this post while waiting for my batteries to charge so I can start testing functionality, and now they are charged!